A Lancaster camera, probably a BB Instantograph. J. Lancaster & Son was a renowned optician and camera maker based in Birmingham, founded in 1835 as optical company. It got a patent on an achromatic meniscus lens in a brass tube which was focusable by means of a lever. 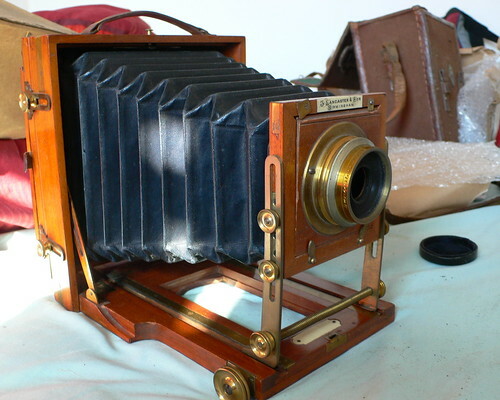 After 1871, when William James hat joined the company, it started making wooden view cameras, among them several cameras for smaller plate formats. The Lancaster Gem Apparatus of 1880, with 12 lenses to make 12 small exposures on a big plate, may have been the company's first exciting novelty. The company produced cameras named Instantograph for many years, during which the design of the camera developed somewhat. It is usually a quarter-plate camera. Early Photography describes the different Instantograph models, shows several examples, and gives some guidance on dating the cameras. The ordinary Instantograph was later renamed the BB Instantograph (for brass-bound), the most extraordinary was named Empire Instantograph. Lancaster made some stereo folding cameras, and some detective cameras, the Rover and Perfect Omnigraph. 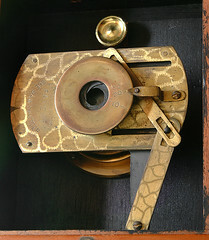 The unusual cameras included the Gem Apparatus of 1880, a camera with twelve lenses, for making 'gem' portraits on ferrotype plates, and the Patent Watch Camera, a tiny plate camera (in two sizes, for gentlemen and ladies) telescoping out of a pocket watch case. Lancaster made its own lenses and had patents on several shutter mechanisms. Other products included magic lanterns. In 1898 Lancaster produced 200.000 cameras, thus having been the largest camera maker in the World. With the decline of plate photography since 1910 the business of Lancaster declined too, until it was ceased in 1955. ↑ 1.0 1.1 Instantograph and BB Instantograph cameras from 1888, 1891, 1893 and 1903, with a list of other Instantograph models, and notes on developments in the standard model over time, at Early Photography. 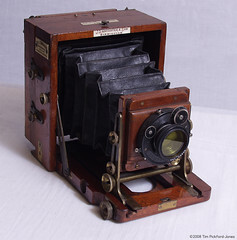 ↑ Instantograph, original model, 1882 at Early Photography. 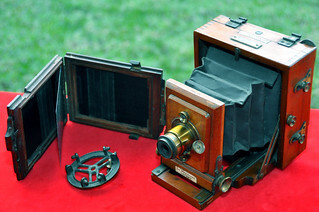 ↑ 1887 Instantograph at Early Photography. This page was last edited on 17 March 2018, at 16:42.